Wolf provides a comprehensive set of investigation support services to facilitate our investigations. Our staff is fully trained to ensure they are proficient and accurate. We have also invested in all of the required equipment and facilities. Wolf's site investigations consist of several activities, including discovering, documenting and securing physical evidence. Photos, video and digital surveys all capture the critical information needed to conduct a comprehensive analysis. When site evidence needs to be secured, our investigators follow evidence handling protocols to ensure the integrity, chain of custody and storage is maintained. Even when there's no case, many of our clients rely on us to conduct investigations to ensure that all evidence is captured and secured. Our investigators are also experienced at on-site analysis. With careful examination of all elements of the site, they discover and reveal information critical to our client's needs. No matter the type or location of the incident, Wolf's investigators are prepared to travel. When a "wheels rolling" case occurs and our clients can't wait for office hours, we are available to respond 24/7/365. Wolf recognizes the critical importance of evidence for civil and criminal litigation. To ensure evidence is available for immediate or future analysis this preservation must be timely and deliberate. We understand the implications of evidence spoliation and the importance of maintaining the chain of custody. We are available to act promptly to preserve evidence. We have trained and experienced crews available to travel on short notice. We possess the knowledge and resources to ensure evidence is preserved for immediate or future analysis. Wolf uses established evidence protocols for collection, processing and storage. We have dedicated and secure evidence storage facilities, as well as the capability to conduct evidence inspections. Our FARO 3D laser scanner provides us with highly accurate and detailed geometric data representing millions of location points from a scene or object. We use these points to reconstruct a crash, investigate a property loss, or reverse engineer a device. Examples include a vehicle involved in an accident, an outdoor scene of a structure fire, or a large industrial machine. The results are used not just for analysis but also for presentation purposes. 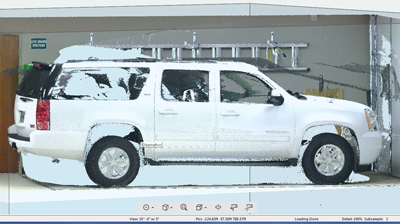 We are able to combine Faro 3D laser scans along with Zone 3D and Scene 3D software with simulation vehicle dynamics, camera motions, and computer generated objects. There are many useful facts and measurements that can be acquired during a vehicle examination. During a vehicle exam general information about the vehicle is noted. This information includes, but is not limited to: VIN number, year, make model, curb weight, gross vehicle weight, brake type, airbag status and EDR availability. An exam also includes a set of 360 degree photos, as well as close ups of the damaged areas for documentation. In the event of significant impact, crush measurements can also be beneficial to the accident reconstruction. There is a certain amount of energy associated with crush. By measuring the amount of deformation on a vehicle we can determine the change in velocity experienced by the vehicle due to impact. Because of the critical importance of tires and wheels to vehicle safety, forensic tire examinations play an important role in vehicle exams. When you consider that only the small contact patch of the tire is touching the road, and this contact is the only thing that enables the driver to accelerate, stop, or steer the car, it is no surprise that the opportunity for failure must be considered. A tire failure can turn a moving vehicle into an out-of-control hazard, both to its occupants and to other vehicle occupants and pedestrians. 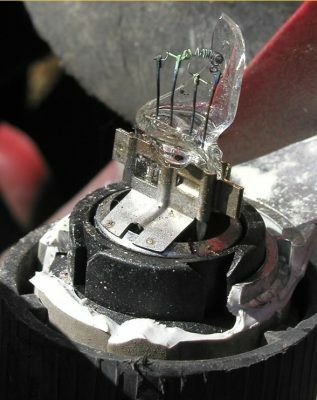 If there is a discrepancy about the status of an incandescent lamp(s) on the vehicle, a lamp exam, in some cases, will help resolve this issue. A lamp exam can typically determine whether a lamp was on or off during a collision. For example the accident reconstruction picture shown to the right represents a head lamp that was on at the time of impact. This is determined from the stretching and elongation of the filament. 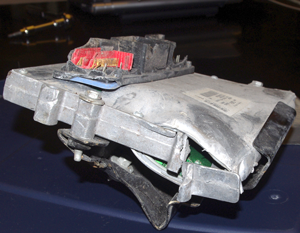 Read our article on Vehicle Forensic Lamp Examinations. When investigating a vehicular accident Wolf’s reconstructionists pay close attention to the vehicle’s tires. When you consider that only the small contact patch of the tire is touching the road, and this contact is the only thing that enables the driver to accelerate, stop, or steer the car, it is no surprise that the opportunity for failure must be considered. A tire failure can turn a moving vehicle into an out-of-control hazard, both to its occupants and to other vehicle occupants and pedestrians. It has been Wolf’s reconstructionists’ experience that the most common cause of tire failures is low tire pressure. We have found this to be true for both passenger vehicles and commercial trucks. Even though a tire may have started out with the correct pressure, several factors can cause a tire to gradually lose air. These include air leaking through the tire (tires are slightly porous). 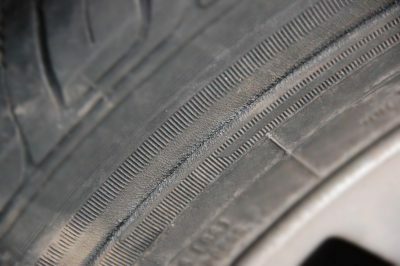 This air passing through the tire can react with the belts and other elements of the tire causing them to become brittle, similar to an aged tire. When a tire is underinflated, the tire’s sidewalls begin to flex excessively, which generates heat, which then leads to the internal belts separating. 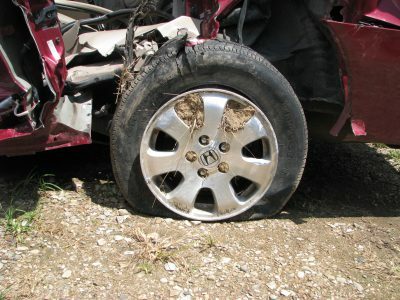 Once the internal structure of the tire is compromised, a blowout (catastrophic failure) may occur and cause the driver to suddenly lose control of the vehicle and crash. Even when the tire more gradually loses pressure from a failure, a driver may lose enough steering capability to lose control. Other factors that can cause a loss of pressure include valve stem failures, small penetrations, sudden impacts such as with chuckholes, damaged rims, and cold air temperatures. There are additional causes of tire failures, one of which leads to the same failure process as under-inflation. An overloaded condition, where the vehicle is carrying weight beyond the capacity of the tires, also causes the tire’s sidewall to flex excessively and to eventually fail. Not surprisingly this condition occurs most often in trucks and trailers. Both under-inflation and overloading conditions share the common term of "over-deflection" of the tire. Sunny weather conditions, particularly in southern climates, can also contribute to tire failures. Petroleum is added to tires to keep them flexible. Excessive air and road heat, as well as UV sunlight exposure, can draw out the petroleum and cause the tires to become brittle. Once brittle, a tire is susceptible to deterioration and failure. Over time, all tires become less flexible and thus more prone to failure. These excessive weather conditions accelerate this aging process. Additional causes of tire failure include excessive and uneven tire wear, penetrations, repair failure, manufacturing defects, abuse, improper tire sizing, flawed vehicle customizing, and solvent-based tire "shine" products. 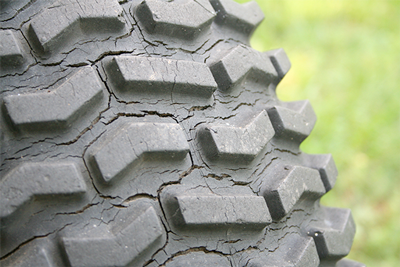 Often a tire exhibits signs of trouble before it fails. Some common indicators of a tire approaching failure are localized rapid tread wear, bulges or knots in the upper sidewall, bubbles in the inner liner, tread cracking, and the appearance of belt wires through the tread or inner liner. Localized rapid tread wear and bulges or knots on a tire are direct indications that a tire has developed a Belt Separation. Uneven or irregular tread wear often indicates an alignment, camber, or toe-in issue with the vehicle. If any of these indicators are unseen or ignored for a long enough time period, tire failure is imminent. Through monthly checks of air pressure and visual inspections of a vehicle’s tires many dangerous tire situations can be avoided. It takes a trained and experienced investigator to determine if a vehicle accident was caused by a tire failure and to determine why the tire failed. Wolf’s experts are always happy to discuss your case with a free initial consultation. A driver of a large coal-hauling truck with seven-foot tall tires began to hear noises from the back of his truck. He climbed down from the elevated cab and walked to the rear to investigate. Just as he reached the tires nearby workers heard a large explosion and saw a large dust cloud. They rushed over and found the driver with severe injuries and a tire with a large tear in its sidewall. What caused the tire to fail? Did a component of the tire fail? Was it an impact with an object? Could it be a failure of the multi-piece wheel, as some suspected? Wolf reconstructionist Jim Casassa, P.E. conducted an investigation an inspection of the tire and reviewed its maintenance history to determine what happened. He noted documents showing the tire’s operating pressure at 105 pounds per square inch (psi). This pressure is more than three times greater than common passenger tires, and combined with its very large volume, resulted in an immense amount of stored potential energy. 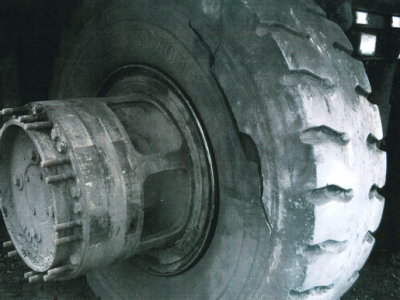 A hard working tire like this must be correctly maintained to ensure the safety of workers. He had earlier examined repair documents describing the tire being repaired and recapped. 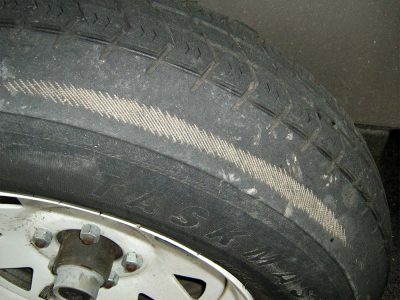 During the tire examination, Jim observed that cords from the steel belt, which give tires their strength, exhibited signs of fatigue failure at the location of the repair. This process replaces the worn tread with new tread. 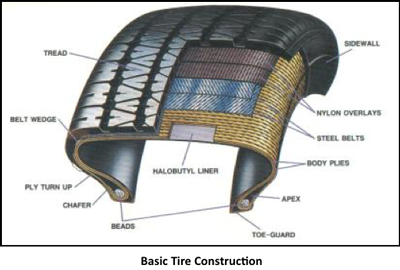 However, the tread must be correctly bonded to the original corded steel belts, tire carcass and repair site. In this case, Jim concluded that the recapped tread began to separate from the cords at the site of the first repair. As he stated in his report: “Steel cords that were not properly bonded were able to flex excessively until they failed in fatigue. Eventually, a sufficient number of cords failed and the remaining cords were not able to contain the pressure in the tire which led to a blowout.” Jim found no evidence that the multi-piece wheel or an impact caused the failure. He concluded that the tire repair facility provided the truck’s owners with a defective tire. A van carrying a group of six people returning from a mission trip experienced a tire blowout while on an interstate highway. The driver lost control and collided with a tractor-trailer. One died of his injuries and several others were injured. What caused the tire to fail? Wolf reconstructionist Jim Casassa, P.E. conducted an investigation and inspection of the van and its maintenance history to determine why the tire failed. He found that the tire had originally been on the front of the van and had a leak repaired by the installation of a plug. The owner had bought two new tires that he had installed onto the front and then had the used tires moved to the rear. Jim also found that the van’s six occupants, cargo and tools might have exceeded the vehicle’s load limit. While inspecting the blown tire Jim observed that the cords of the steel belt had failed at the site of the repair. It is well known that a tire repaired using plugs penetrates the belts and liner, which leaves them vulnerable to failure. Many tire stores refuse to install plugs because of the safety and liability concerns. When plugs are used, inner patches should also be used to maximize the safety of the tire. Jim also observed indications of over-deflection, which is caused by an under-inflated or overloaded tire. This condition can weaken the steel belts and eventually cause them to fail. In this case he was unable to definitively determine whether under-inflation, overloading, or both conditions were present on the failed tire. He determined that tire repair and the-over deflection condition likely combined to cause the tire failure. Had these conditions been avoided the accident would not have occurred. Most vehicles on the road today have event data recorders (EDRs) that store information such as speed, throttle position, brake application and seat belt usage. The data is typically recorded when an event occurs and can be "imaged" with special hardware and software. This imaging process creates an image of the data without removing it. The triggers for these events can be a collision that does not deploy the airbags in a passenger vehicle, a collision that does deploy the airbags in a passenger vehicle or it could be a significant application of the vehicle brakes for a large tractor-trailer. We are able to download virtually all passenger vehicles that possess the data recording capability. Current law states that all passenger vehicles produced after September 1, 2012 are required to be able to be downloaded by non-original equipment manufacturer (OEM) entities. Most commercial trucks also use some version of a data recorder. We are able to download the data for most Class A tractor/trailers. We work with our industry partners to get the data for the rest. Many mid-sized commercial trucks do not have data recording capabilities. Contact us to determine specific makes, models and years. 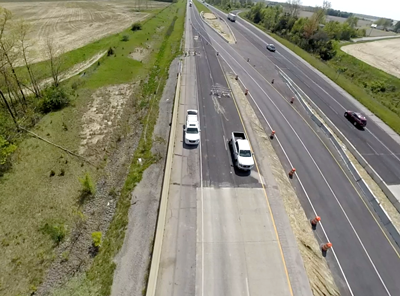 The downloaded data is used to supplement physical evidence to complete an accident reconstruction of a collision. Our specially trained and qualified traffic accident reconstructionists can answer your questions about the data available. This data can also be used to develop trial graphics. Learn more about Wolf's EDR services from our pdf flyer. 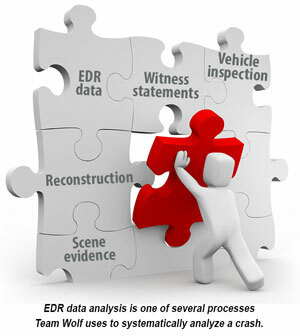 Contact us to determine if a particular car or truck has EDR data available. Do you and your team want to learn more about vehicle data recorders? We are available to provide a complimentary presentation on this and other topics to your group. Brakes and wheels are the components whose neglect most often results in serious injury and property damage. Air brake systems must be regularly checked and preventative maintenance performed to ensure the system remains in top working order. 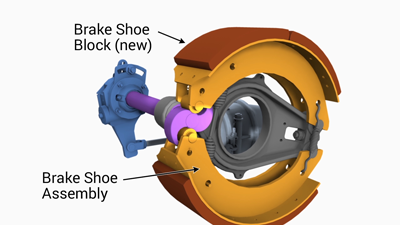 Worn out brake shoes, excessive free play ("slack"), and non-functioning slack adjusters are some of the parts that commonly lead to a situation where the driver is unable to stop in a safe distance. Improperly secured wheel nuts or poorly maintained wheel bearings can result in a wheel and tire assembly weighing more than 500 pounds careening down the road. Wolf owns a testing device for inspecting air brake systems. The Vericom® V’Stroke Meter is a portable computerized system to quickly and accurately measure airbrake pushrod travel on tractors, trailers, straight trucks, buses and other airbrake equipped vehicles. 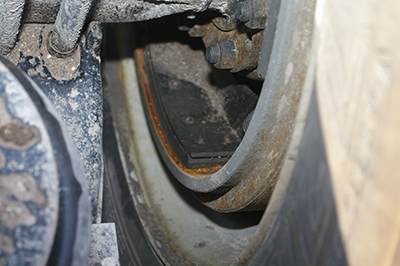 By measuring the pushrod travel, investigators can determine if the air brakes were adjusted properly. Improperly adjusted brakes may not perform effectively and as a result may be a causal factor of a crash. This inspection method is more accurate, consistent and time efficient than the traditional manual method of testing. Photogrammetry is the science of making measurements from photographs. For a reconstruction, this ability becomes important when physical evidence is lost and photographs are all that remain. Wolf’s analysts use photogrammetry to measure the lengths and shapes of tire marks, to calculate the heights of suspects in surveillance videos, to calculate the speed and positions of vehicles and pedestrians in surveillance videos, to develop three dimensional models of objects, to measure vehicle crush, and more. The photogrammetry process is capable of reconstructing depth from a set of pictures. Like the eye, the computer must gauge the similarities and differences between pictures to reconstruct the depth. In order to measure objects, we need some known real-world measurements to establish a scale factor. When there's enough of the right kind of known measurements, we can then determine the unknown measurements. For example, if we need to find the position of a vehicle that has been involved in a collision, we may use the width of the street lanes as a known value. The computer then uses this information to establish the position of the vehicle. Of critical importance to a photogrammetric analysis is the preservation of the original photo or video evidence. Unfortunately, it is common for parties to inadvertently degrade the quality of photos and videos by changing their format, image size, posting them on photo and video sharing sites for convenient downloading, or inserting them into documents. Always retain video and photo prints and files in their original state to ensure there is no loss of data. Two of Wolf's investigators, Joe Hubert and Mike Harkness, are FAA Certified Remote Pilots. 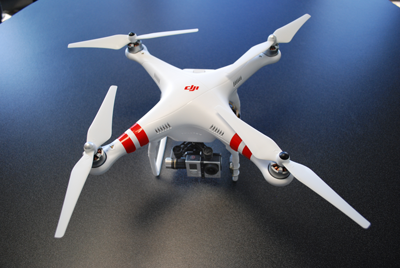 This authorizes them to operate Wolf's quadcopter UAS (unmanned aircraft system) to capture images and video footage at incident sites, such as vehicular crashes, fires and construction sites. We then use this footage for analysis and presentations.